Alongside the wealth of art and architecture of Florence there are also some wonderfully manicured and well kept gardens. They range from the formal classical Renaissance layout to the rustic, let nature have its say look. All are lovely peaceful, green spaces where one can escape the chaos of tourist trails, have a quiet picnic and ignore the horns of the Florentine traffic. 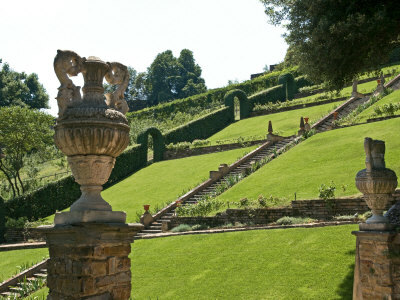 Boboli Gardens – Piazza Pitti or Via Romana, open 8:15 – 6:30 in the summer and 4:30 during the winter, admission €4. This 42,000sm park is attached to the Palazzo Pitti Museum and is a classic 16th century Italian garden, planned by Nicolo Pericoli. The grounds were originally outside the city walls and the site of Florence’s town quarry. However when the Medici acquired the grounds they soon had them landscaped and turned into formal gardens behind the palace. By 1766 the family had opened the parkland to the public as an excellent example of a Renaissance garden. The park features many attractions of its own like the Grotto Grande, the KaffeeHaus, a lawn of columns and the Lemonary, all making this quite a unique and revolutionary park for its time. Cascine Park– always open, admission free. Cascine Park is the largest park in Florence restored in 1786 and opened to the public, previously it was a game reserve and cattle farm, until in 1869 it was remodelled in the romantic style of the period. It now has a lovely tree lined avenue and a number of sporting facilities including a racetrack, the Indian Prince, Rajaram Chuttraputti’s memorial and the Cascine pyramid and amphitheatre. Giardino dei Semplici, the Botanical Gardens of Florence – Via Pier Antonio Micheli 3, Open to the public 9 – 1pm Mon – Fri, Admission €4. Built for Cosimo dei Medici in 1545 and is one of Italy’s oldest and most renowned medicinal plant gardens. It is designed around a grid pattern with walkways leading to a central fountain. The gardens have over 9,000 species represented and some of its oldest inhabitants include a Yew tree from 1720 and a Cork Oak planted in 1805. Giardino della Rose, and the Giardino della Iris are both near the Piazzale Michelangelo, admission free, both parks are open to the public. The rose garden is always open and along with its marvellous collection of rose bushes, there are also a selection of water lilies and the impressive view across Florence’s skyline. 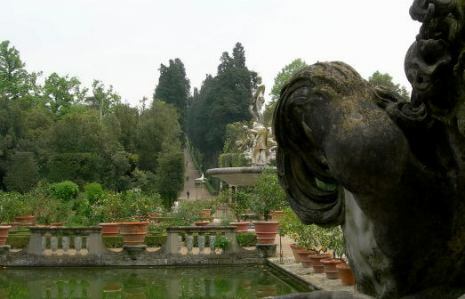 Similarly the Iris garden houses a display of over 2,500 varieties of plant that has long been the symbol of Florence. This park is best seen during the month of May, Monday – Friday between the hours of 10 – 12.30 and 3 – 7, and all day at weekends. Torrigiani Gardens, Via de Serragli, these gardens were designed in the 19th century by Luigi Cambrai-Digny and later completed by Bacconi who installed the gothic tower and Merlin’s Grotto in the park, while Pio Fedi placed the neo-classical statues. Although the park is now in private ownership it is occasionally opened to the public. Giardino della Fortezza is a pleasant open parkland with a lake, fountain, paths and benches on the northern corner of the Fortrezza da Basso. After town wall was demolished this completely open park was formed as part of the gentrification of the area. 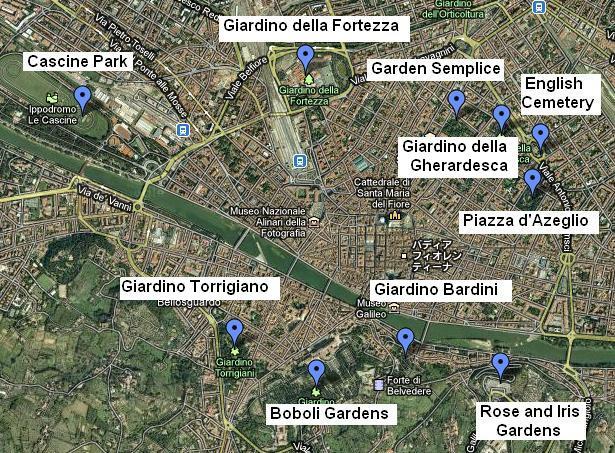 Bardini GardenVia de Bardi, opposite the Bardini Museum, open 8:15 – 6:30 in the summer and 4:30 during the winter. This recently restored Italian Renaissance garden has picturesque views of the city and is full of statues and natural wildlife. Piazza d’Azeglio was once a private walled garden, used by the villa, palazzo and houses around its perimeter but nowadays it is a large open green space with statues and trees where people can sit and enjoy their lunch in the shade. Piazzale Donatello, this is where you will find the English Cemetery, not a traditional garden but it was always treated as one, by the citizens of Florence. 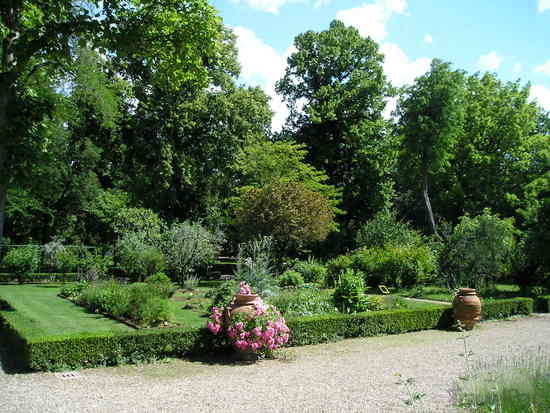 Since the restoration of its tall Cyprus trees and box hedgerows it is once again attracting people for its natural beauty and unique style. Open from 9 – 12 & 3 – 6, admission free. Giardino della Gherardesca is the largest private, walled garden in Florence and is owned by the Four Seasons Hotel. If you would like to take a self-guided tour of Florence we have published a helpful 3-Day Walking Guide to aid you on your travels, alternatively contact us for information about our rich and entertaining guided trips around the wonderful Tuscan and Umbrian countryside. 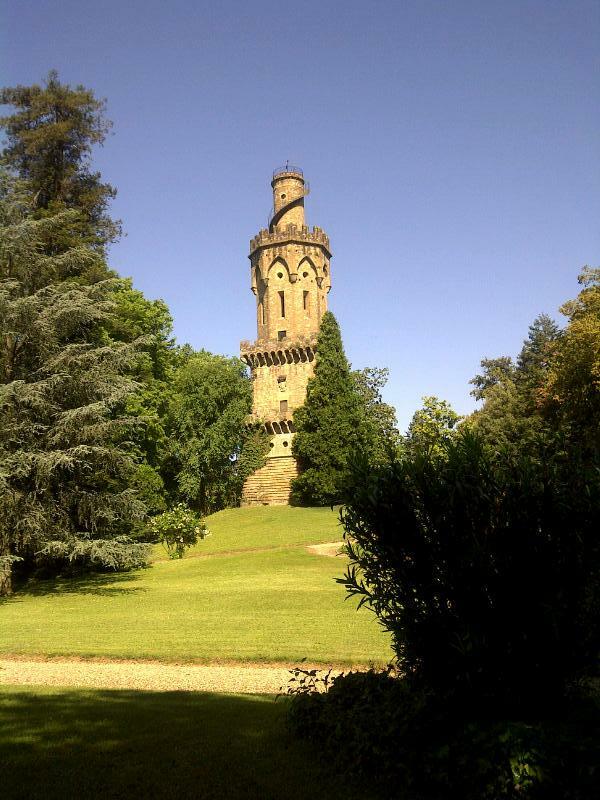 This entry was posted in tours and tagged Boboli, Florence, garden, gardino, holiday, tours. Bookmark the permalink.